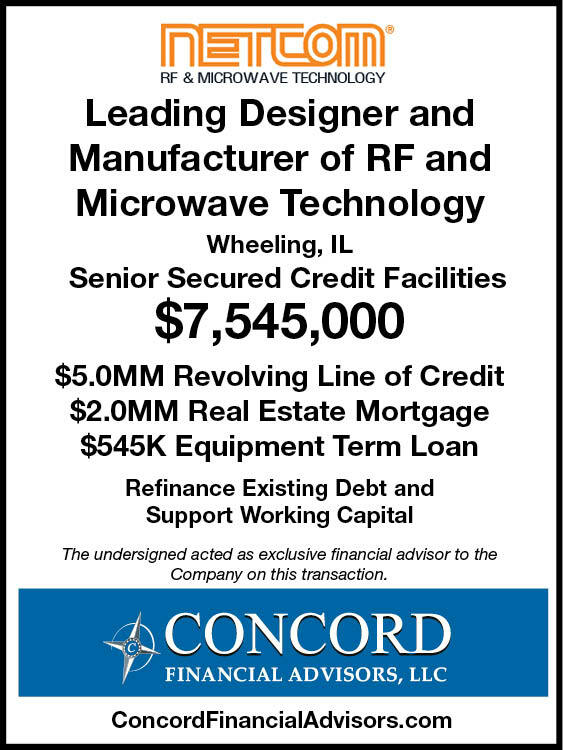 Concord Financial Advisors, LLC announces the closing of $7.545 MM of Senior Secured Credit Facilities for a leading radio frequency technology company in Wheeling, IL (“Company”). The Company has been in business for more than 40 years, but found that it was no longer a fit for its bank’s definition of a target customer. The Company had been seeking a new banking relationship on its own, but was not satisfied with the progress it was making. After being introduced to the Company, Concord quickly determined that the Company’s core business was solid and would be an attractive “relationship client” for many financial institutions. Concord quickly identified the most appropriate senior lenders for the Company and prepared a detailed memorandum summarizing the key aspects of the Company, coupled with setting up a data room with all pertinent information for select lenders. Concord threw on its 16 years of experience and conducted a targeted and efficient deal process with regional and national asset-based lenders, along with local banks. Concord procured multiple competitive proposals for the transaction. The Company was able to achieve its objective of obtaining an attractive financing structure with a local bank that can support its senior debt needs, including a revolving credit facility, a term loan, and a real estate mortgage. The Company’s owner and management team were impressed with the resulting financing structure and the attractive economics of the transaction.